High Pressure Grease Hose Reel Spring Retractable Grease Hose Reel Series RT - 3/8� I.D. 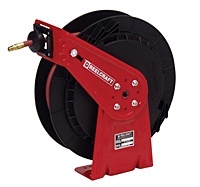 Reelcraft's Series RT is an economical choice for a medium duty, lighter weight, spring-driven hose reel for applications that are less demanding, yet require a product that can withstand industrial and commerical use. The industrial-grade drive spring is protected from the environment in a polypropylene spool for longer service life. Guide arm adjusts to seven positions.